En papillote. For some reason when I hear those words it conjures up disturbing images of culinary failure. I haven't really been able to pinpoint it until tonight but I guess I have some repressed memories of en papillote. My first encounter with this cooking technique was in culinary school. I'd been assigned a project with some students and we met after class to experiment. The three of us managed to happen upon what had to be the sketchiest butcher shop in all of Providence where we purchased something the butcher claimed to be lamb. 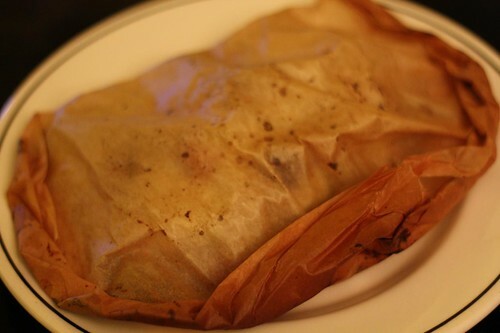 I'm not really sure why we thought doing lamb en papillote was good idea but I supposed that is irrelevant. By the time we got back to the other student's apartment we determined, even with our lack of culinary knowledge, that this meat was either from a very different animal than a lamb -- perhaps from another solar system -- or from a very diseased and elderly lamb normally referred to as mutton. After smashing the "lamb" meat for about twenty minutes with all manner of object from the kitchen we were able to tenderize it to the point where it was almost chewable. Tonight I started on better footing by laying out my parchment paper and getting started on tonight's papillotes. I laid down a bed of arugula, topped it with boiled, sliced Yukon Gold potatoes, and then a seasoned piece of tilapia. On top of that I laid out some thinly sliced zucchini and some Seggiano roasted tomatoes with the oil they were in. I also topped it with a few pats of butter, lemon zest, and a splash of white wine. After that I wrapped it up and, for some reason, place the most poorly wrapped of the bunch up front for the photo. 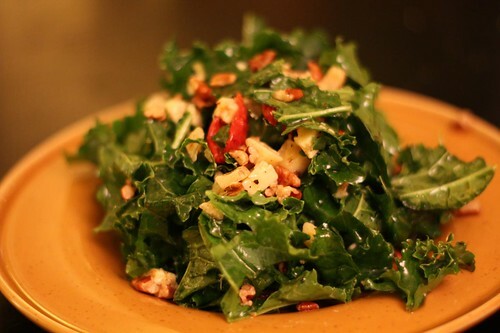 For salad I tossed some kale with the remaining roasted tomatoes and their oil and threw in the leftover stilton and some toasted pecans along with lemon juice, salt, and pepper. The strong tomato flavor from the oil made up for the fact that there were only about three or four tiny tomatoes floating around in the salad. I'm reminded of another en papillote experience. 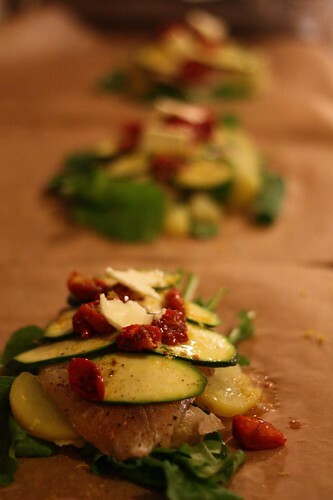 At my first post-college cooking gig I was working at a restaurant and the chef had made a special en papillote. I was the one he assigned to make them and, wouldn't you know, his parents came in for dinner that night. Then I mad them and they came into the kitchen to ask who the marvelous chef was who had prepared this for them. The chef told them it was me which gained me applause from all the kitchen staff. As I moved past the chef, tears in his eyes, and out of the kitchen I found that the entire dining room was filled with clapping patrons, those who were facing away had turned in their seats and I was given approving nods from the well-dressed clientele. No, that's not actually what happened. Instead the dish got sent back because it was undercooked. This caused the chef to take the small paper sack from the waiter and throw it into the oven with such force that the partially eaten meal was planted against the back of the oven as he shut the door. He never said anything directly to me about it but the personal shame from the incident carries over to this day. 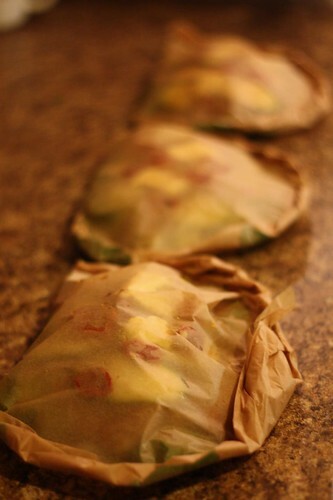 Hence, the difficult thing about en papillote: there's really no way to tell when it's done. That's why I cooked tonight's dinner until I was 100% positive that it was done. Then I cooked it an additional 10 minutes. I couldn't run the risk of Jen biting into partially cooked tilapia then storming off to the kitchen and throwing it back into the oven with all her might. Those wounds run pretty deep. When opened I found they were perfectly done. And quite tasty. 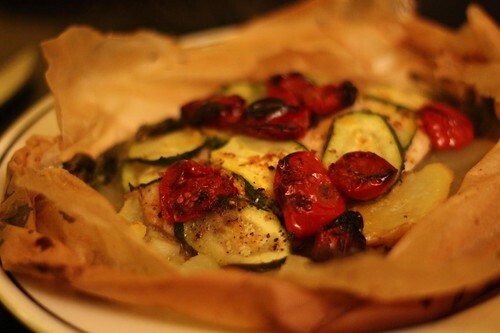 After more than twelve years hiatus I had returned to the en papillote scene triumphant. This afternoon we went to Ikea. That always seems like a good idea until you get there and have been there for several hours and realize that all the strength has left your body and you're only halfway through the store. To pay myself back for this trial I purchased some little tiny glasses for grappa. I hadn't intended to use them so soon but all of the old traumatic memories of en papillote failures had made me feel I needed a drink. 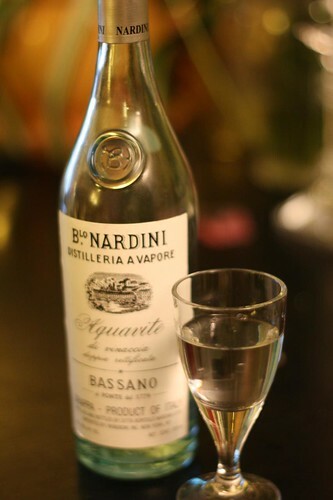 So it was that I wasn't sure if I was drinking this grappa to celebrate tonight's success or lament the failures of yesteryear. One thing was sure though: my new grappa glasses are pretty awesome. The best $1.99 I ever spent.